Ludwig Schiessl, 76, of Baldwinsville, NY and formerly of Kearsarge NH, died March 18, 2014 after a long illness. He and his wife Dorothy had vast knowledge of the White Mountains and amassed an important collection of White Mountain memorabilia. Born in Cham, Bavaria the son of Johann and Antonie Schiessl. Ludwig emigrated from Germany at age 23 to New York City when he was recruited by the New York Athletic Club to represent them as a long-distance runner. After competing in the 2nd Mt. Washington Road Race, he remained in the Mt. Washington Valley where he was hired by Joe Dodge to work for the Appalachian Mt. Club. He packed supplies for the hut system and he later became assistant Hut Master at Pinkham Notch. After that he was employed by Krones Inc, as a labeling machine specialist and traveled throughout the world. In 1986 he was hired as a maintenance supervisor for Anheuser Busch, Baldwinsville, NY where he remained until retirement. During his competitive running career which began in the early 1960’s, Ludwig medaled and won numerous foot races, competing with the top runners in the world. He made his mark with the NYAC and the BAA running clubs. He also competed in the Millrose Games. Upon retiring to Kearsarge, NH, he continued to run with the White Mountain Milers. He loved numerous outdoor sports and competitive activities. He biked, canoed, kayaked and competed in cross country ski events, hiked all the NH 4,000 footers in one summer and was devoted to the care of his beloved Mt. Kearsarge, North, which he ran, hiked and explored for over 15 years. Ludwig was also a man of many talents and interests. He was acutely knowledgeable on the subject of the history of the White Mountains of NH. As a craftsman, he pursued wood carving, furniture making and created exquisite Nantucket baskets. In Bavaria he majored in landscaping and horticulture. While living in Ipswich, MA, Upstate, NY and NH, he propagated and exhibited alpine plants and perennials, some of which he exhibited at the Boston Flower Show, achieving many blue ribbons. Born with a special voice, Ludwig sang as a child in Germany and also in his later years. He performed as a bass with the Ralph Ferris Choir, The DeCapo Singers, The Mt. Washington Valley Choral Society, The Jackson Community Church Choir, and most recently the Plainville Christian UCC Church Choir. Ludwig was a member of the Jackson, NH Historical Society, The NH Historical Society, a former member of the American Rock Garden Society, and its CNY chapter, The Primula Society and was a current member of the Old Hutmens Association. Upon returning to CNY he became a member of the Beaver Lake Nature Center where he enjoyed walking the three mile loop and achieved 400 miles while in a state of declining health. He also enjoyed watching his grandchildren’s sporting events, fishing and completing complicated puzzles. Ludwig is survived by his wife, Dorothy Friend Schiessl; daughter, Heidi Fogarty; son, Dr. Christopher Schiessl; his step-children, Ann MacDonald, Martha (Timothy) Whiting, Molly (Geoff) Lange, Timothy (Jennifer) MacDonald; his brothers, Johann (Hannelore) Schiessl, Anton (Anna Marie) Schiessl, Bernd (Tina) Schiessl; sisters, Michaela (Wilhelm) Geringer and Steffi (Bernhard) Voelkl. He will be greatly missed by the many lives he touched. To quote author and writer, Steve Caming, in reference to Ludwig “Old Hutmen never die- they’re just waiting up ahead on the trail for you”. Calling hours are 4 to 7 p.m. Friday, March 28, 2014 at the Falardeau Funeral Home, 93 Downer Street, Baldwinsville, NY. Services are 1 p.m. Saturday, March 29th at the Plainville Christian UCC Church, 752 W. Genesee Rd., Plainville, NY 13137. In lieu of flowers, donations may be made to the following: The MWV Habitat for Humanity, #2 Common Ct., N. Conway, NH 03860 or The Jackson Community Church, PO Box 381, Jackson, NH 03846. Bob Temple died on Sunday, March 16, 2014, just months shy of his 97th birthday. Bob was born in Amesbury, Mass. on June 1, 1917, son of Howard and Edna Temple. He attended Amesbury High School, Worcester Academy and Dartmouth College. His association with the White Mountains began at an early age and continued throughout his life. 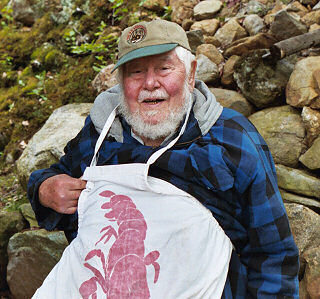 He worked for the Appalachian Mountain Club for years while living in Jackson with his wife, Virginia, and daughters. He moved with his family to Foxboro, Mass. in 1953 where he was employed at the Foxboro Company. He never forgot his New Hampshire roots and always maintained a home in Jackson. After he retired from the company, he moved back to the place he loved best, Jackson. Bob is survived by his three daughters, Ann, Karen and Christy; his eight grandchildren; his nine great-grandchildren; his best friend, Digger. His wife, Ginny, died in 2006. If you would like to honor Bob’s memory, a donation to your local humane society would be appreciated. “It is the end of an era for the O.H. Association with the passing of Bob Temple on March 16th, 2014 a few months shy of his 97th birthday. He was born in Amesbury, Mass in June of 1917. He was educated in the Amesbury Schools, Worcester Academy and Dartmouth College. Bob’s association with, and his love for the White Mountains began in 1924 when he first visited Jackson, NH with his parents, and continued for his whole life. Bob worked at the AMC’s Madison Springs Hut for Joe Dodge in 1938 and in 1939. He helped build the Hutman’s Cabin and worked cleaning up the 1938 Hurricane. He worked on the summit of Mt. Washington for the Yankee Network and helped build the Yankee Network building on the summit. With America’s entry into WWII, Bob was recruited by M.I.T. to work on support and logistics for classified projects related to the war effort. Among his adventures was a voyage oversees on the Pam Am flying clipper to train R.A.F. Radar Operators and surviving Nazi bombing raids on England. Bob stayed on with M.I.T. until 1947 when he returned to the White Mountains to work for Joe Dodge at Pinkham Notch Camp, as Joe’s assistant. By now, Bob was married to the former Virginia Grant, a cousin of Joe’s wife Teen, and they had two young daughters, Anne (who is an O.H) and Karen. A third daughter Christy was born in 1949. Ginny passed away in 2006 and Bob is survived by his three daughters, eight grandchildren, and nine great grandchildren as well as his faithful dog Digger. As Assistant Huts Manager, Bob was Joe’s right hand man and as he was mechanically inclined, capable, and physically fit, he ran all over the hut system, keeping things running. In 1953 Bob was recruited along with fellow O.H. Sam Goodhue and Vin Lamnna to work for the Foxboro Company in Foxborough, Mass. At the Foxboro Company, Bob was a trouble shooter, working in quality control and traveled extensively overseas on company business. Bob kept his Jackson property while employed with the Foxboro Company and upon his retirement, he moved with Ginny to his beloved Boulder Brook Farm on Thorn Hill Road in Jackson, NH. He ran a tractor, trucking and bark mulch delivery service and stood his ground on what he thought was right for the Town of Jackson. He was at every Spring Brawl, faithfully cooking the clams and lobsters and as he got older and more rickety, he greatly enjoyed raising hell and yelling at me and everyone else helping because we weren’t doing it right. There will be a remembrance gathering for Bob at his home in Jackson on Saturday May 10th, 2014. 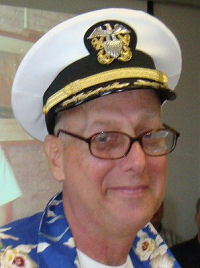 CDR Ethan Ensign DuBois (USNR), 60, of Bristol, passed away peacefully at home on Friday, March 7, 2014. Ethan was the loving husband of Linda Lou Borges-DuBois, the proud father of Thomas DuBois, Timothy DuBois and Edward DuBois, and the son of Sara (Shaw) DuBois and the late James DuBois. Ethan was a graduate of Brown University and a 20-year Navy veteran. A dedicated Boy Scout Leader, he positively influenced many boys on their path to adulthood. Ethan’s passion was music. A 20-year member of the Bristol Interfaith Choir, his baritone voice contributed to many Christmas and Fourth of July Concerts. Born on the 4th of July, Ethan embraced Bristol as his home and the home of the oldest Fourth of July Parade in the country. For many years Ethan celebrated his birthday by marching in the parade in full military uniform as a member of the Bristol Train of Artillery, firing his musket for all to hear. In lieu of flowers, contributions can be made to the Dana Farber Cancer Institute, the Bristol Fourth of July Committee, or Narraganset Council Boy Scouts Of America.